Limpias, or spiritual cleanses, are very popular in Mexico and throughout Latin America. From before the European colonization of the Americas to present day, people with financial problems, who have been left by lovers, or who have lost their jobs have often gone to the local shaman to be cured of their “bad energy.” The limpia ceremony involves playing indigenous instruments and a very particular, studied combination of gestural movements around the affected subject. My limpia is inspired by the ceremonial practices of the Seri indigenous people of northern Mexico and the Lakota drumming traditions of the American plains. 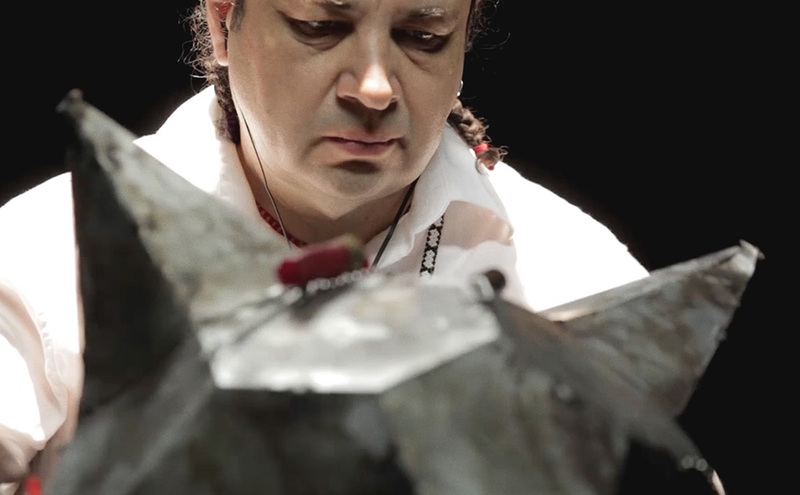 The instruments used for my limpia include a jug shaker (Agitanque), a piñata covered in Border Patrol gun shells (Piñata de cartuchos), and the Zapatello, based on Leonardo da Vinci’s invention known as the Martello, a mechanized hammer. 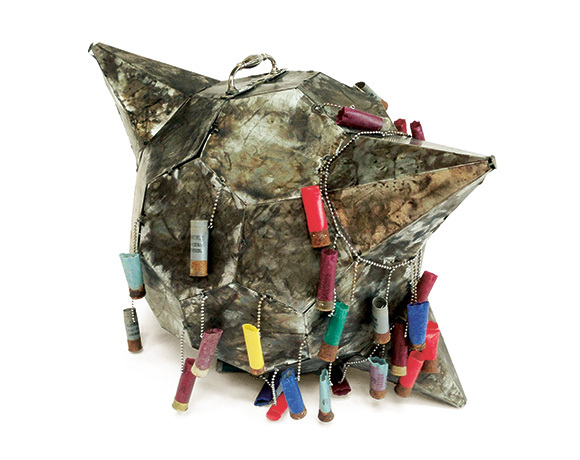 This metal piñata was inspired by two objects: the West African instrument shekeré—a gourd covered in a net of beads or seashells—and a soccer ball stranded on the U.S. side of the border. Instead of beads, colorful shotgun shell casings found on a Border Patrol shooting range adorn its surface. 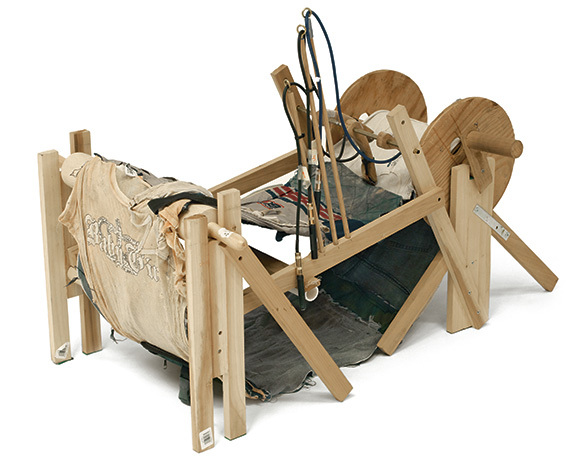 This loom, a powerful symbol of home and tradition in Latin America, rotates a loop of discarded clothing. Contact microphones mounted on three arms amplify the sound of the clothing as it rotates. 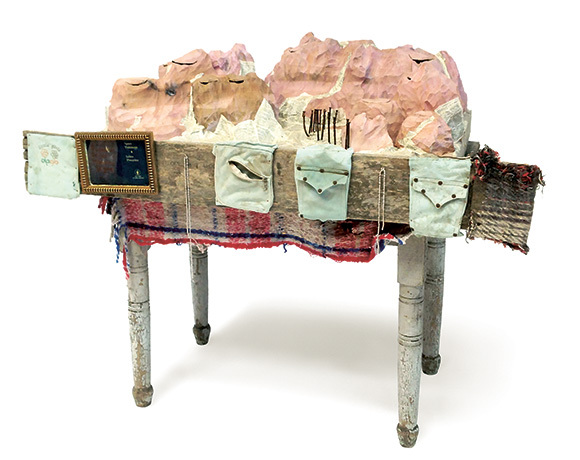 The drums, capped with skins made from inner tubes used to cross the Rio Grande into Texas, are wedged into a structure fashioned out of carpet booties used by immigrants to hide their footsteps, and the barbed wire that once served as the fence between the two nations. In his trips to the border, Richard kept finding mysterious effigies dressed in immigrants’ discarded clothing. Their arms are extended as in ecstasy or celebration. Perhaps, as animals do, they are trying to scare their predators by pretending to be bigger. Whether they are scarecrows or signals in the road, these effigies were the inspiration for this string instrument, built out of crossed pieces of hollow wood—the resonant box for two rows of strings situated across its “chest.” The two larger strings at the top are used to create a deep, fundamental tone that defines a tonal center, while the thinner strings in the chest vibrate in sympathy with a second row of strings. 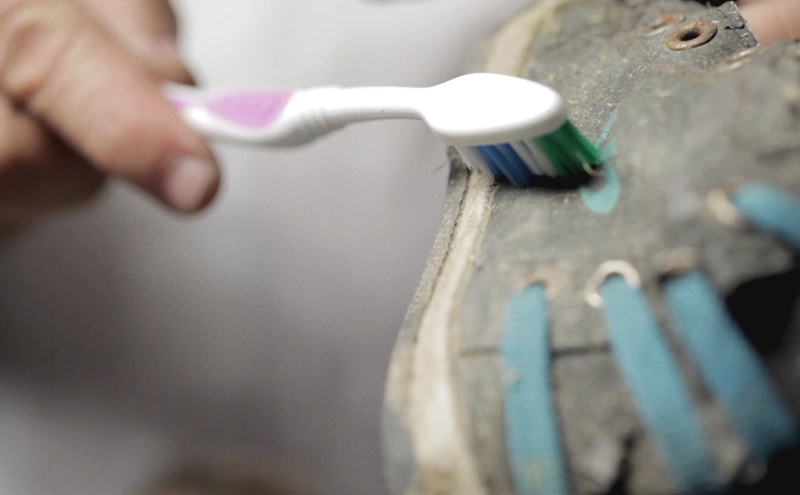 Meanwhile in the background, the Zapatófono, an immigrant shoe that is rubbed against gravel, produces the whooshing sound of the invisible migrant, walking through the night. 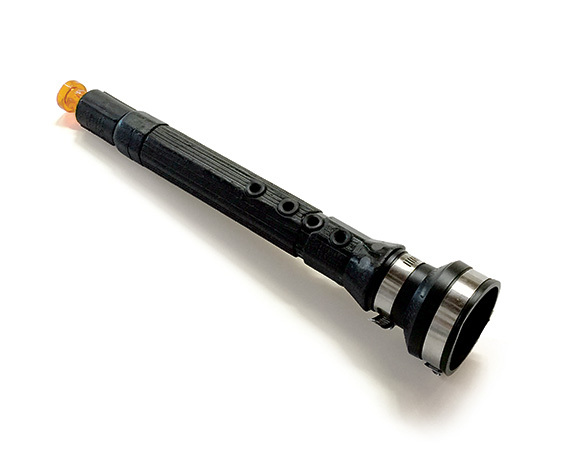 This plastic trumpet, fashioned out of a Border Patrol flashlight, refers to the derogatory name some Border agents call migrants: “tonk” is the sound a flashlight would make when hitting someone’s skull. 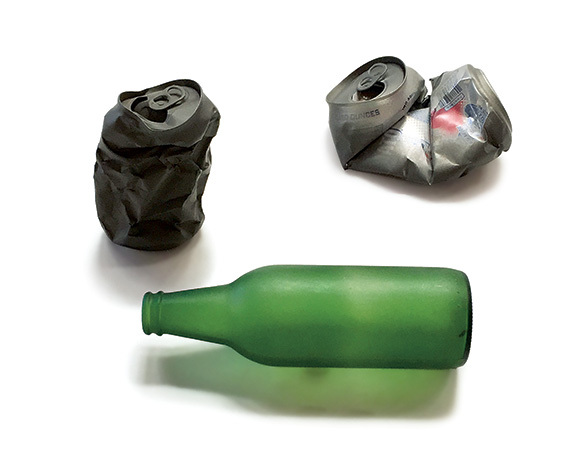 Empty cans and bottles are used as wind and percussion instruments (aerophones). 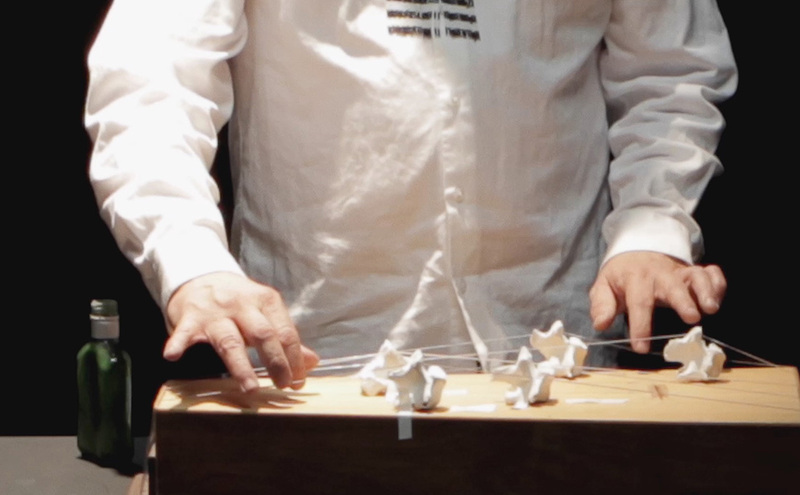 This instrument, made using vertebrae found on the Texas border, is a zither that can be plucked, bowed, or activated by toy cockroaches scrambling across the surface of the box. It is reminiscent of a small Japanese koto. “Cockroaches” is a derogatory term commonly used by anti-immigrant groups to refer to immigrants. 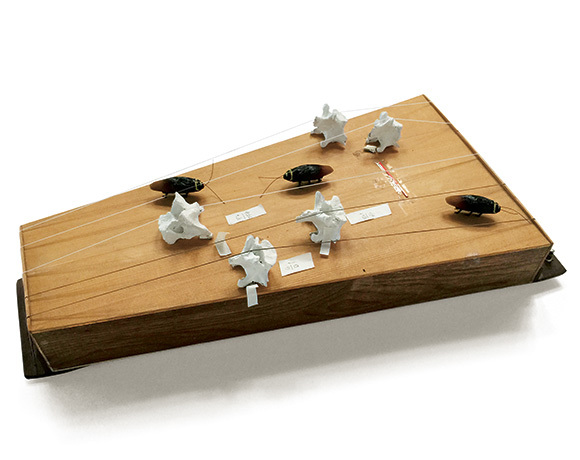 This piece of music uses the sonic texture of toy cucarachas rumbling in the upper board of the Huesocordio, a zither with bone bridges based on the Japanese koto. 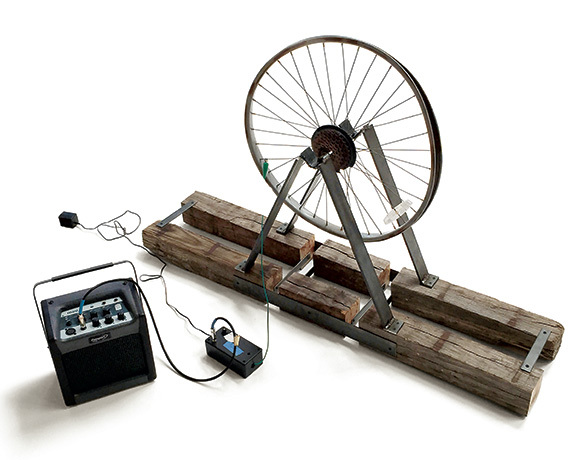 This drone opens a musical dialogue between a percussive riff, agile string pizzicatos, and the cry of carefully tuned bottles found along the border. 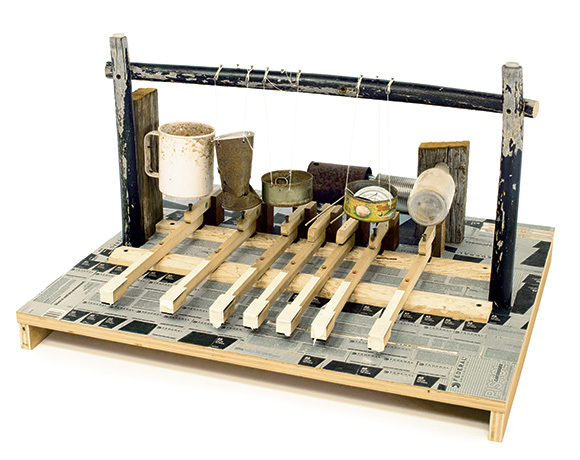 On this keyboard, empty cans, bottles, and a plastic cup act as piano strings. The surface of the instrument is decorated with Border Patrol ammunition boxes. Based on Richard’s photograph, this soundscape involves mountains made of resonating hollow wood reminiscent of the Aztec percussion instrument teponaztli. 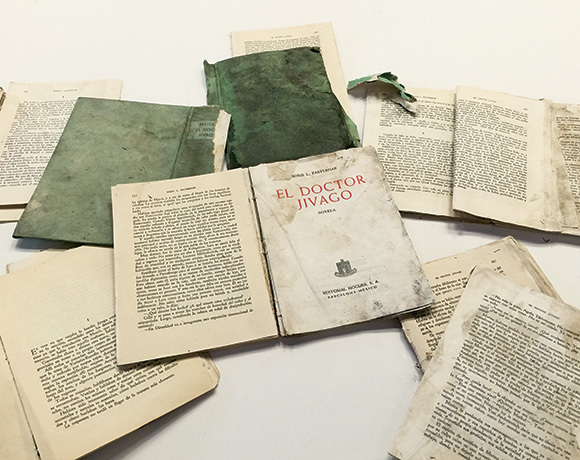 The rusted nails, suggestive of the Border Wall, can be plucked or stroked, and the valley floor is covered with the pages of a Bible inscribed to a girl, found on the Texas border. 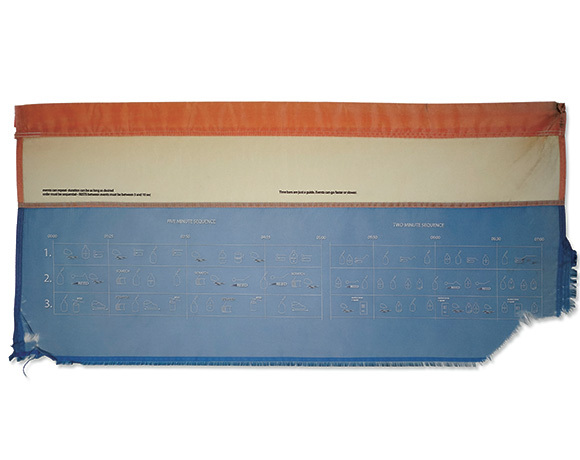 A series of my graphic scores titled the Partituras estación de agua (Water Station Scores) are printed directly onto a group of weathered flags found at the border. 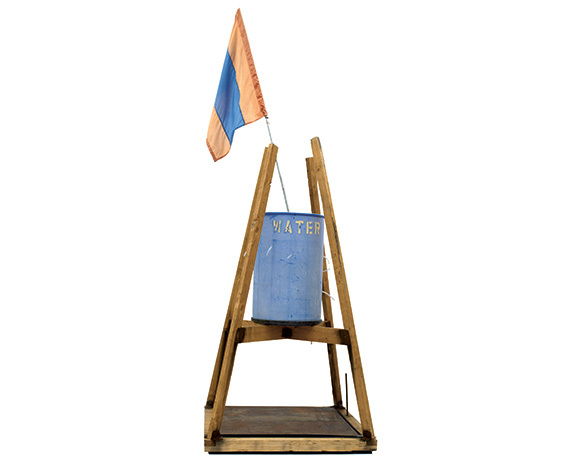 These discarded flags were donated to the project by the citizen-run humanitarian organization Water Station, which uses them to indicate the presence of water tanks placed in the California desert. This particular flag contains the score for a section of the second movement of my piece “Voces del Desierto,” indicating a series of sonic actions to be performed in a given amount of time. According to a Pew Research Center analysis of previously unreleased government data, in the past several years there has been a huge increase in unaccompanied children aged twelve and under trying to cross the U.S.–Mexico border. 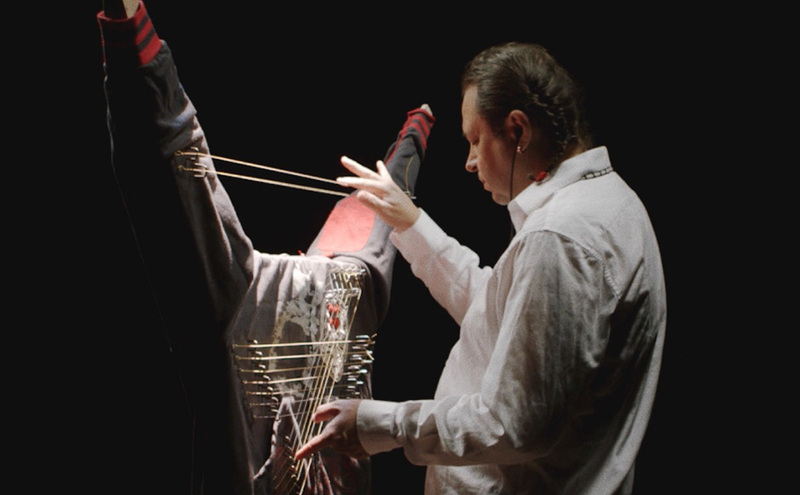 Using a Micro Orchestra that includes tiny objects left behind by children and the Erjumex (a string instrument based on the Chinese single-stringed instrument called an erhu, using discarded Jumex—a popular Mexican fruit juice—cans as resonators), this piece amplifies their unheard voices in a carefully built, abstract symphony that only children can understand. 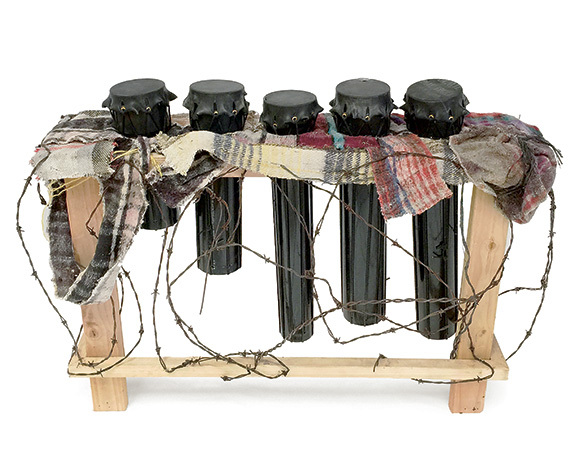 These water jugs used by migrants are filled with gravel and shaken in various ways to produce different sounds. 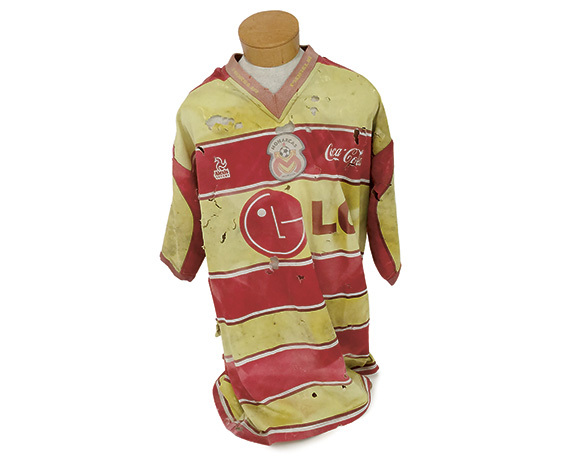 A soccer jersey hangs from a wooden mannequin as if on display in the window of a sports store. 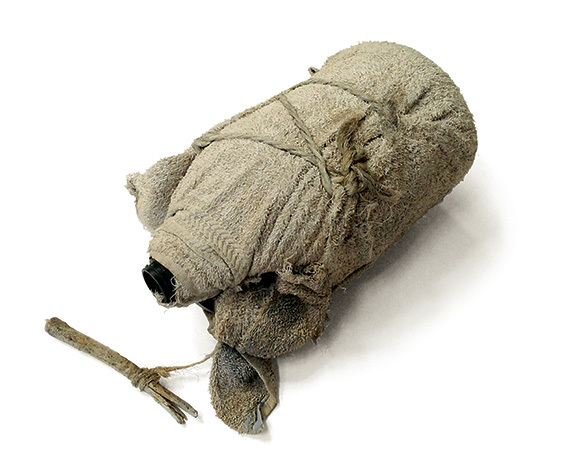 A speaker inserted inside the chest reproduces the faint murmurs of a galena crystal radio set. 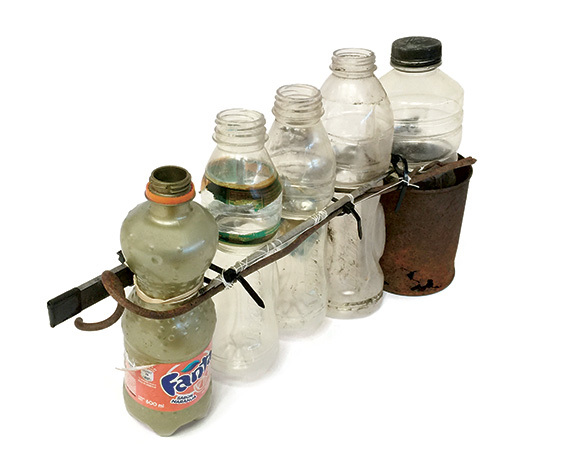 Two instruments were made from a bicycle run over by the Border Patrol to prevent its use. This one, Ojo, is a hacked theremin that produces sound as one interferes with its electromagnetic field. A water barrel that was once set up as a migrant water station has become a fountain of tears, based on vandalized stations shot up with bullets. 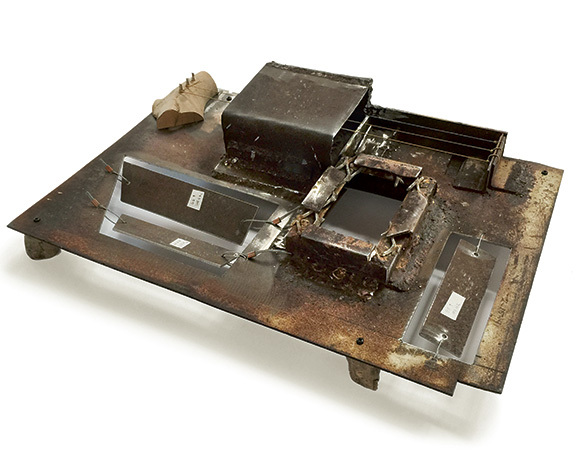 Water drips from small holes onto a metal plate, like rain falling onto a tin roof. 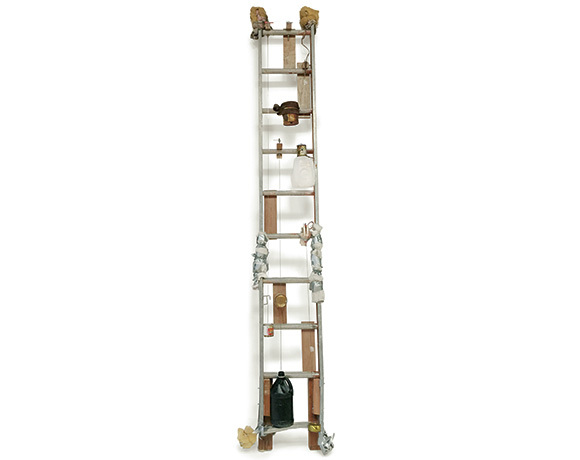 An inexpensive aluminum ladder used for scaling the Wall was converted into a string instrument that is amplified by plastic jugs and cans. A twisted iron section of the original Border Wall dangles from an enormous wooden structure, representing the wings of an angel or a hanging man. It is played like a giant gong. 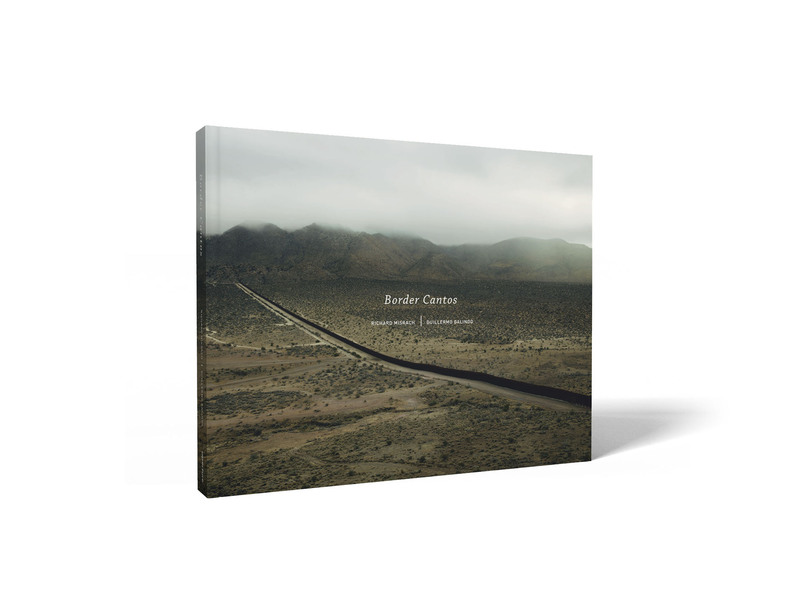 Border Cantos presents a unique collaboration between photographer Richard Misrach and composer Guillermo Galindo. Misrach has been photographing the two-thousand-mile border between the U.S. and Mexico since 2004, with increased focus starting in 2009—resulting in a distinct melding of the artist as documentarian and interpreter. The latest installation in Misrach’s ongoing Desert Cantos series, this project includes eight suites of photographs—some made with a large-format camera and others that have been captured with an iPhone. Misrach and Galindo have worked together to create pieces that both report on and transform the artifacts of migration: water bottles, clothing, backpacks, Border Patrol “drag tires,” spent shotgun shells, ladders, and sections of the Border Wall itself, which Galindo then fashions into instruments to be performed as unique sound-generating devices; video clips of those performances can be seen on this site. He also imagines graphic musical scores, many of which use Misrach’s photographs as points of departure. Josh Kun contributes an introduction and epilogue to the Border Cantos book. He is the author of Audiotopia: Music, Race, and America (2005), winner of a 2006 American Book Award, and his criticism has been published in the New York Times, Los Angeles Times, American Prospect, Los Angeles Magazine, and LA Weekly. Kun is professor of communication at the Annenberg School for Communication and Journalism at the University of Southern California. 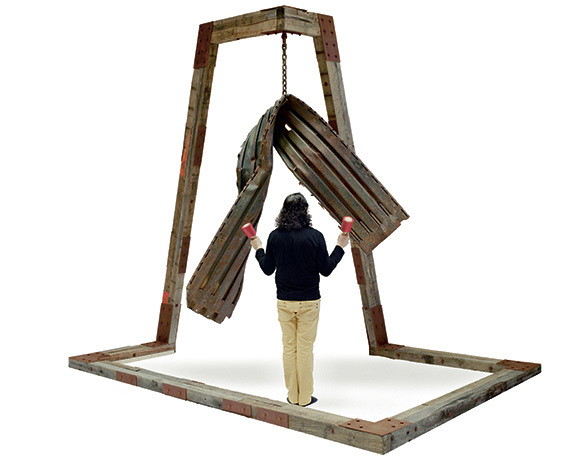 In her influential 1979 essay, “Sculpture in the Expanded Field,” art critic Rosalind Krauss noted a new school of American artists making large-scale sculpture that differed from traditional monuments because they were not commemorative or historical; they were the monument’s “negative condition.” Decades later, the Border Wall has truly become the monument’s “negative condition” but in moral and ethical terms, a statue of un-liberty that funnels the tired into desert bottlenecks and tracks the poor through gulches. It is a monument to the aesthetic and fiscal reaches of political theater, and a thuggish mirror of national and cultural phobias—to the limits, not the depths, of the democratic imagination. The photographs of Misrach help us understand this. The musical instruments of Galindo help us hear it. When experienced together, however, they have the potential to do something else: to activate our own visions and our own scores for the American monuments that might still be possible to build. The publication of Border Cantos was made possible, in part, with generous support from Andrew Brown and Kristen Wolfe, Bruce and Sharyn Charnas, and Lannan Foundation.